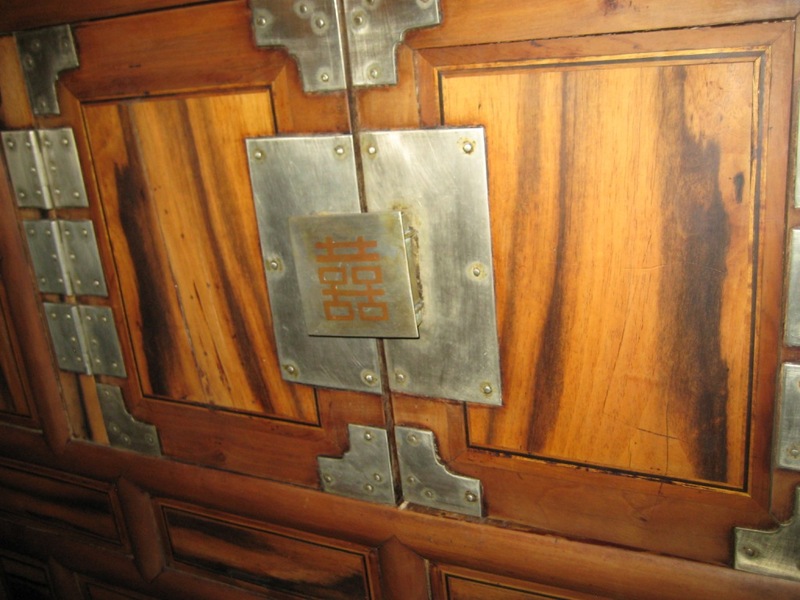 1880, persimmon wood, white brass, “Double Happiness” in copper on lock-plate; Cheon Chu City. Certified. 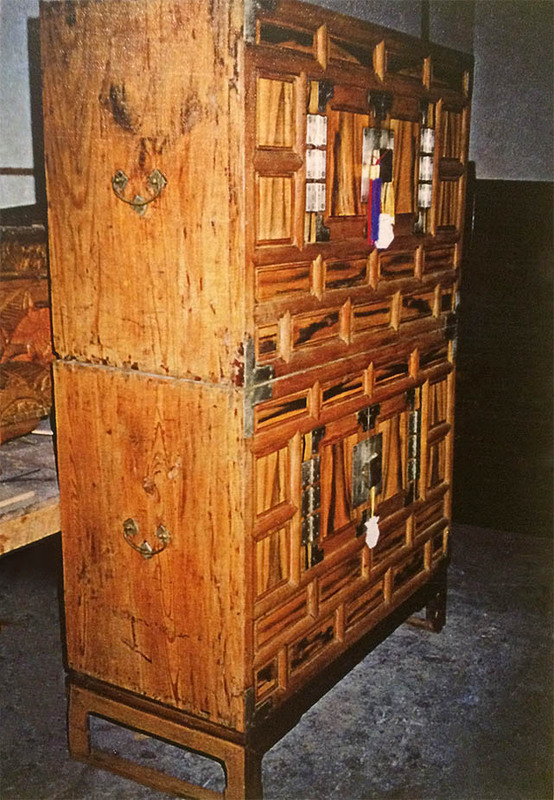 34.25″ w, 16.5″ d, 55.5″ h.
This chest from Cheon Chu City is rare and valuable. This city was once a where wealthy financiers lived. It was also where many scholars and members of the wealthy land-owning Yangban class gathered, preparing to take an open Imperial Examination the passing of which guarantees upward mobility. These people could afford to commission quality furniture to decorate their mansions. This double chest is made from persimmon wood, split in such a way to take advantage of its beautiful contrasting dark and light grains to form the front panels to create a scenery image. This technique perfected by Korean craftsmen takes away the need of elaborately painting and decorating a piece of furniture. The only decoration on wood is the use of metalwork. On this chest, it is white brass as simple-shaped lock-plates, hinges and corner protections. 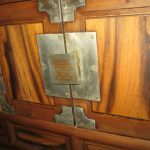 A distinctive piece of decoration is a copper “Double Happiness” motif incised on white brass on the lock-plate of each chest. Brass handles at the sides of each chest makes it easy to lift and move the chests. This magnificent-looking chest was most likely made for a wedding. White-brass is said to be extinct by the end of the 19th century, so this chest decorated with it is now rare and valuable. (Picture from certificate).